A carefully chosen gift can go a long way toward putting a positive spin on the transition back to school. The key is finding a gift that is outside of the ordinary. These back-to-school presents are fun, functional, and guaranteed to get kids of all ages excited about being back in the classroom. From tech gadgets to funky school supplies, you'll find something that perfectly fits that special student. Locker decorating is a tween and teen trend that's here to stay, and according to Teen Vogue, a locker rug is a must-have piece of the puzzle. The Locker Fur Rug from The Container Store is a stylish and budget-friendly choice. 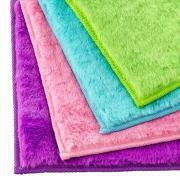 The 11-inch by 17-inch fur rug has a non-skid rubber backing and is designed to fit most school lockers. It comes in green, pink, blue, or purple. You can purchase the rug at The Container Store. Back-to-school is a great time to get a fresh start on fitness as well as academics. For kids and teens who prioritize both health and style, it's hard to beat the cool looks and high tech functionality of the UP fitness tracker from Jawbone. It's easy to see why CNET included this handy little device in its list of Great Wearable Tech for Heading Back to School. This cool wrap-around design has a sculpted surface and comes in two colors - black and silver-grey - to match any outfit. Water resistent, lightweight, and durable, it will stand up to the rigors of an active kid's lifestyle. It tracks sleep, calories, and steps and syncs with most smart phones. The UP2 comes with an adjustable band to fit most wrists. 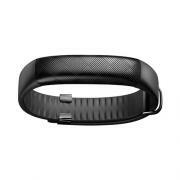 You can purchase it directly from Jawbone or from many other tech retailers. Kids can't go back to school without some good old number two pencils, and a company called Scent Co. Inc. has made that standard writing implement a bit more exciting. A former teacher at Your Golden Ticket Blog called them the "coolest school supplies item ever," and it's easy to see their appeal to kids of all ages. 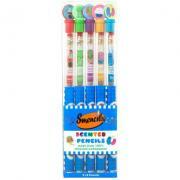 The Smencils are made out of recycled newspaper and come in a wide variety of scrumptious scents. A five-pack includes cupcake, cola, rainbow sherbet, jelly bean, and sour apple. You can purchase a five pack, as well as many other options, directly from the Scent Co. Inc. website. Pencils aren't very useful if you can't keep them sharp, and the unicorn pencil sharpener has a well-earned place on Babble's list of 15 Super Cool Back-to-School Supplies. It would make an adorable gift for a kid of any age. The white unicorn head has a sharpening hole for you to insert the pencil, which then becomes the horn. It comes with a silver pencil. 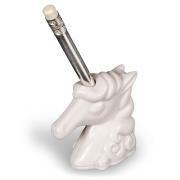 You can purchase the unicorn pencil sharpener at many gift stores online, including Amazon.com. For girls of any age, a charm bracelet can be a great way to commemorate heading back to school. Care.com reports that this is a popular gift for a new school year, and it can be really special if you choose charms that have meaning to the student. The Colorful Crayons Back-to-School Charm from CharmStory is a great place to start. The Pandora-compatible charm is crafted from silver-colored metal and has red, yellow, and blue crayons. Consider adding charms for each subject she studies. You can buy the back-to-school charm and other options, including bracelets, from the CharmStory website. One of the hardest things about the back-to-school transition is waking up for school each morning, but you can start the year off right by giving your favorite student a special alarm clock. Red Tricycle included the Lego Star Wars Yoda clock on its list of cool alarm clocks for kids. The clock also has dozens of five-star reviews on Amazon.com, where it is praised as being a great gift for kids of any age. The clock is based on the Lego Minifigure for Yoda and is made to scale. It's about eight inches tall and features a digital display that lights up when you push on Yoda's head. 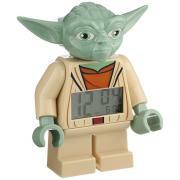 You can buy the Yoda Lego Minifigure alarm clock at a variety of retailers including Amazon and Bed, Bath, and Beyond. For older kids, an e-reader can be the perfect way to celebrate the new school year. According to Family Circle, e-readers are ideal back-to-school gifts because they encourage kids to read for fun, and they are handy for taking notes and highlighting important passages. Plus, most classic literature is free to download. The Amazon Kindle has many features that are designed to be student-friendly. A small subscription fee allows kids to access hundreds of books targeted to their reading level, and parental controls can help parents make sure book choices are appropriate. The National PTA has endorsed the Kindle as its official e-reader. This is a good option for kids starting second grade and up. 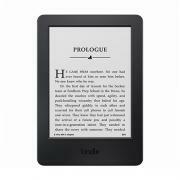 You can purchase a Kindle from Amazon.com. Notebooks are necessary for school, but they don't have to be the plain options you can find at the department store. Instead, kick things up a notch and make your student feel extra special with a personalized notebook or two. 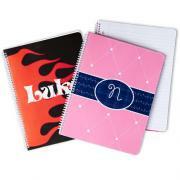 Globetrotting Mommy recommends Frecklebox personalized notebooks, which come in almost 100 different styles. You can personalize these 50-page notebooks with a student's first name. Because the pages are wide-ruled, this gift is a better choice for elementary-grade students. You can buy a personalized notebook, pictured here, from FreckleBox.